ο οποίος προσφάτως (15 Ιουλίου) έκλεισε τα 85 χρόνια της πολύτιμης ζωής του. Χρόνια, που τα περισσότερα από αυτά γέμισε με ανεπανάληπτους μουσικούς θησαυρούς. περισσότερο από κάθε άλλον κιθαριστή, πως οδήγησε το ρεπερτόριο της κλασικής κιθάρας στην σύγχρονη κλασική μουσική. Ας του ευχηθούμε λοιπόν, ακούγοντας κάποια από τα αριστουργήματα που ο μέγας Benjamin Britten του εμπιστεύτηκε. Η επιλογή έγινε από τον συνεργάτη του TaR Δημήτρη Κυπραίο και θερμά την προσυπογράφω. Χρόνια σου πολλά λοιπόν Δάσκαλε! Να είσαι πάντοτε ευτυχισμένος και δημιουργικός. 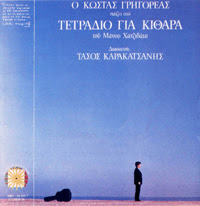 This entry was posted in από 5/2010 και μετά and tagged classical guitar,classical music,Τζούλιαν Μπρημ,κιθαρα,κλασική κιθάρα,κλασική μουσική,Julian Bream on Ιουλίου 19, 2018 by Kostas Grigoreas. 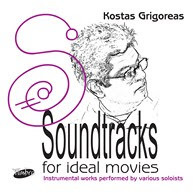 Kostas Grigoreas talks about his «soloist-composer» nature, how to be open to new ideas and how to use music tools to experiment with everything, without hesitation. What does music mean to you personally? It is difficult to answer. Music has been part of my life as long as I remember myself. Do you agree that music is all about fantasy? I agree, but I think that fantasy cannot function without reality. Combining both in a composition or performance, gives the essential contrast that leads to musical excitement. If you were not a professional musician, what would you have been? Probably an engineer, related to electronics. I love everything that is related with technology and I feel happy that I can use it to create, perform, record and promote music. On the other hand, if I was not musically talented, I would probably be happy as a recording engineer. The classical music audience is getting old, are you worried about your future? What do you envision the role of classical music to be in the 21st century? Do you see that there is a transformation of this role? Of course there is a transformation. The classical music performer is not anymore in his room practicing countless hours for the „one concert“. The classical composer is not anymore creating music „to be discovered“ some years later. Music technology and use of the internet has given new tools for everyday creation and performance. Reaching your audience is a completely different process, in comparison to the (even near) past. When I say that classical music is searching for new ways or that classical music is getting a new face, what would come to your mind? Classical musicians were never isolated. Absorbing ideas and feelings from other cultures and music genres was always an inspiration for all really talented artists. However, music from all over the world is now at our fingertips (and ears) all day long. It is normal that classical music should become more and more „open“. For me, that is a blessing. I can perform or create music as I want it, no obligation to be „tonal“ or „atonal“ or „serial“, etc. My artistic palette may include everything, without any guilt! Do you think we musicians can do something to attract the young generation to the classical music concerts? How will you proceed? I think that being honest and simple is enough. Young people don’t like the snobbish attitude in art. Of course, mixing sound with video, acting, dance, etc. can help to expand our audience. I like every creative collaboration of the arts. But I also like the simplicity of „just music“. To close your eyes and immerse yourself in music. Tell us about your creative process. Do you have your favorite piece (written by you). How did you start working on it? It i not easy to answer. I have been a guitar soloist for all my life and I cannot „escape“ from that attitude. Quite a lot of my guitar works were created to be performed by myself. However, some of them proved to be more suited to my performer’s personality and they have become „mine“, and maybe I love them more, as I enjoy them through performance. Some were suited to others, and they „went away“. Generally speaking, I see my music from a distance. Maybe it is normal, as I am a composer that needs motivation to make music. Most of the time, that motivation is the admiration for others, musicians or groups that finally perform them. We, Moving Classics TV, love the combination of classical music with different disciplines: music and painting, music and cinematography, music and digital art, music and poetry. What do you think about these combinations? We are musicians, but mainly we are artists. Collaboration with other arts is an obligation and a great motive for creation and artistic pleasure. Can you give some advice to young people who want to discover classical music for themselves? To listen as much as they can to the work of the great masters of our art, composers, performers, maestros. To be open to new ideas and (if they are technically educated) to use their music tools to experiment with everything, without hesitation. Classical music in the 21st century is the only music that really has no borders. Think about it. You are free to create or be in any style you want. You can even create your own unique style, no need to be labeled as experimental, traditional, jazz, rock, etc. Now it is common practice in the media to say that classical music is getting into the consumption business, do you agree? We are speaking about the supply and demand rules and how to sell your “product”, in your case your compositions. How do you see it? You cannot create honest art following the market rules. Innovation can rarely become profitable. Fake innovation yes, all media are full of clichéd audio products labeled as „brand new“. Of course, a work of art can become mainstream and profitable when it matures. Nevertheless, I believe that an artist must be free from market rules. That is why I think it is necessary for all kinds of fine art to be financially supported, preferably by the state. What projects are coming up? Do you experiment in your projects? I am now recording some solo works, including my favorite guitar composition by Benjamin Britten „Nocturnal after John Dowland, op.70“. 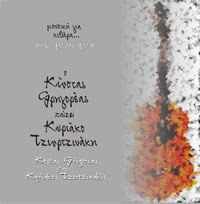 I am also preparing a collection of works by me, performed by various small instrumental groups. To conclude, I should mention that I like to make music for solo instruments or for small groups where each instrument „plays a role“. Probably, my soloist-composer nature leads me to that. 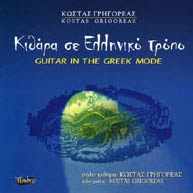 This entry was posted in από 5/2010 και μετά and tagged classical guitar,classical music,Greek music,Grigoreas,guitar,Γρηγορέας,κιθάρα,κλασική κιθάρα,κλασική μουσική on Ιουνίου 7, 2017 by Kostas Grigoreas.